When was the last time you searched a hotel and it didn’t appear on TripAdvisor review website? Many of us have come across such search results. The point is to give you an idea of how TripAdvisor has penetrated in the travel and hospitality market in the last 18 years. Launched in 2000, TripAdvisor review website’s journey is an interesting one. With few years of struggle in the initial years and then a spiraling growth to become one of the biggest travel websites globally. The travel giant’s 60 million+ reviews play a crucial role as a real friend to travelers. The leading global metasearch witnesses high web traffic and is sought after by many travelers. Adding 200+ booking sites into its kitty, the travel giant compares the prices of hotels and F&Bs. It gives travelers an option to choose from 4.3 million restaurants and 9 million+ hotels worldwide, providing the best deal. Now, you may be curious to know how you can get more bookings through TripAdvisor listing and reviews. Right? You already have your hotel listed on TripAdvisor. If not, initiating your hotel presence on the review website requires you to claim your business listing on Tripadvisor. Once this is done, you need to add attractive images, a brief description of your hotel, room, and rent. Add the TripAdvisor Traveler Reviews App to your Facebook page. You can request free stickers from TripAdvisor to put those up at your property. Once you confirm the online booking, the stickers will be delivered to your hotel within few days. Increase the possibility of your hotel link being clicked manifold times. You can find out how it works in detail. What are you waiting for? Use it to prosper now! TripAdvisor Review Express is a review collection platform that approaches your recently checked-out guests. Once you enroll in this program, your hotel software will automatically send your checked-out guest details to TripAdvisor, using which TripAdvisor will ask them to review your hotel. The reviews you receive will be reflected on your TripAdvisor page which you can post on your hotel website and booking engine too. This way you enhance the credibility of your hotel. Creating a buzz on social media platforms by posting positive hotel reviews [that are posted by guests on TripAdvisor website] is one of the strategies to boost your Tripadvisor hotel rankings. A consistent approach in posting TripAdvisor reviews and messages on social media can give your hotel impressive results. Even tagging your guests can help you increase your reach. You know how important it is to get in touch with your guest directly. This is possible with TripAdvisor’s instant booking. So, without any upfront investment, you can own the guest relationship from the beginning itself. Once your visitor or guest confirms the booking, you need to pay commission on the basis of “Book on TripAdvisor” quarter and half scheme respectively. 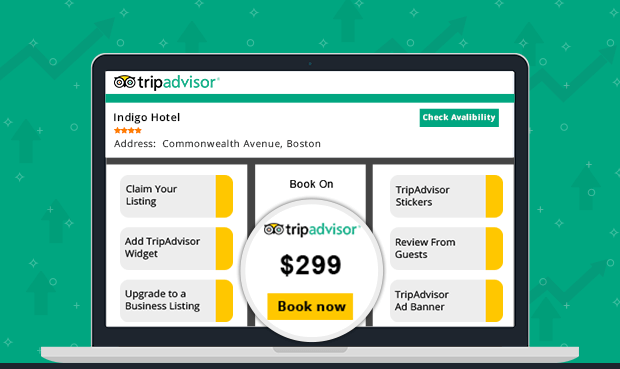 Connect your hotel with TripAdvisor’s premium connectivity partner to get an increase in direct bookings. Engage your guests on social media by downloading the app for free from the Widget Center. You’ll also find a pre-written Facebook post and Tweet in the “Display your Award” page of the Management Center. Use them to share the good news with your followers. You can even display the awards at your hotel to impress your guests. TripAdvisor reviews site announces awards every January, and are in the 18th year of their successful journey. Winning one of TripAdvisor’s Travellers’ Choice awards is the ultimate recognition that hotels aspire to have. Once you get the recognition, it skyrockets your hotel’s rankings on Tripadvisor and hotel revenue too. Don’t forget to display this in your hotel as well as on social media. As nowadays, it is necessary to build your online reputation. This requires managing reviews/feedbacks and responding them on time. Responding to negative reviews is a priority task. Here you must be honest. The way you respond will be noticed by all the current and future guests. You can reply by acknowledging the inconvenience caused and a solution to it to resolve the situation. While you can welcome and reply to encourage the positive feedbacks. Ask your all guest to give reviews. Setting up an automated email – asking for a review, that is scheduled after a day of the guest checkout. Once you get a reply to this email you can check and post it on your hotel website from TripAdvisor listing and reviews too. Finally, working on all these tips will allow your hotel to get observed via TripAdvisor listing and reviews. And, get more bookings from Tripadvisor. As simple as that!